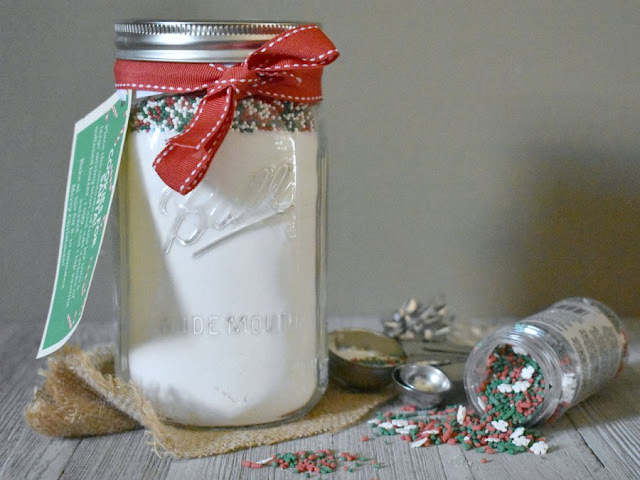 These sweet sugar jars are loaded with festive sprinkles that are ready to be baked into sugar cookies. They make great gifts for teachers, friends or the big man himself! 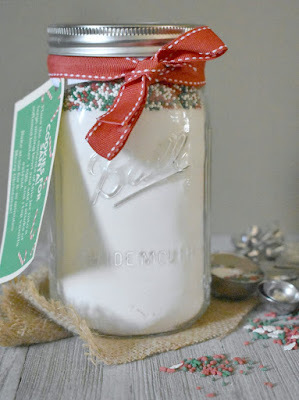 Whip up these festive jars filled with the dry ingredients needed for sprinkle filled sugar cookies. 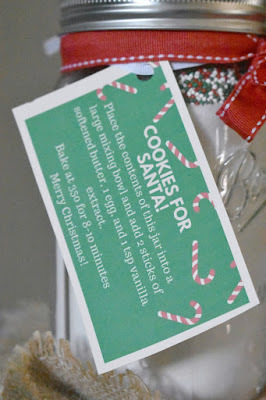 The printable cookies for Santa tag will give the recipient the directions to take the jar and turn it into delicious cookies. It is a fun to make and fun to give Christmas gift. There are so many people we'd love to show our appreciation for this time of year. If you think about it, there are a ton of folks that make an impact in our lives. Some are big some are small, but even seeing a friendly smiling face can make a difference in your day. If we lived in a world where time and money were unlimited, it would be nice to give everyone a nice gift to show them how much they mean to us. However, the world we live in has a finite amount of time and keeping a budget is always good. Plus there is the basic problem of where to put all of the things you get. If you are like me, you already have more stuff than you need and the storage space always feels limited. So I like to give edible gifts. They are a great way to solve the problem of storage, you just eat it instead! Plus there can be very budget conscious and are always well received. Get the printable instructions tag HERE! I know I always love getting gifts like this, a mix in a jar. It makes whipping up a treat fun and easy. Plus it sometimes gives us an excuse to make something we otherwise wouldn't have thought to make. Leave a few on a plate for Santa and everyone is sure to be happy! If you are looking for more fun Christmas in a jar ideas, be sure to look below. There are tons of fabulous ideas from my 12 Days of Christmas blogger friends. Combine the flour, salt and baking powder in the bottom of the jar. Put the sugar on top of the flour mixture. Finish with desired amount of sprinkles. Tightly close jar and tie the printable tag with ribbon. Everybody loves cookies- this is a great gift idea. I'm sure Santa will love them. Plus everything is better with sprinkles. Love it! 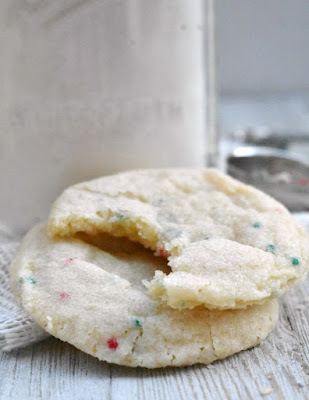 Sprinkles do make things more festive, don't they? This is a fun idea! It's festive and sure to be loved by those who receive it. The sprinkles are great! This is a wonderful gift. I come from the tradition that food is love so I think this is a great idea. I'm completely in love with this gift idea! thanks for sharing on our gifts from the kitchen link up for celebrate 365 Blog party! I'd be thrilled to get something like this. Makes Christmas baking so much quicker and easy. Perfect for those who don't bake too! IT does make it easy and fun! I love giving gifts like this that will get used up! Me too, nothing to dust! This will be a very special gift to give or receive! Hope you are enjoying your week and thanks so much for sharing with us at Full Plate Thursday!